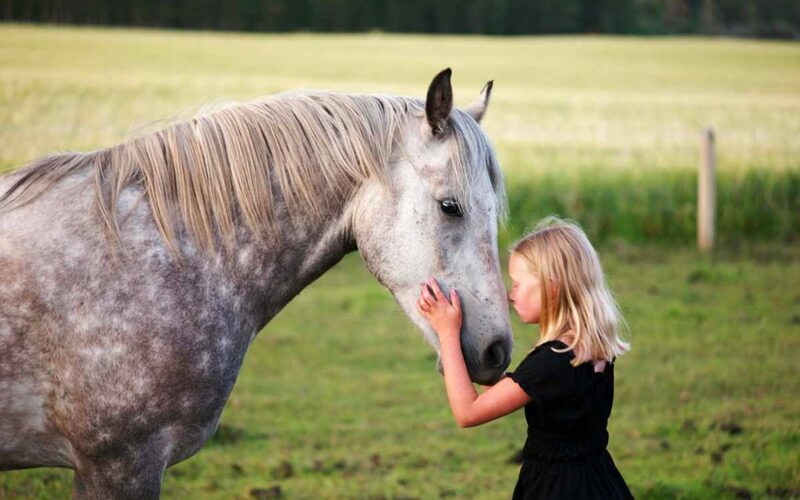 My daughter has generously given me permission to share a recent paper she wrote on attachment theory which I believe relates well to our work at Healing Hooves. This paper is not about animals and it’s not about equine therapy. But it is about relationships and why they influence our ability to heal, learn and grow. And animals and equine therapy are all about relationships. Thanks Maren, for being willing to share your writing! The psychological theory explored within this paper is attachment theory, which emphasizes the importance of building secure interpersonal attachments as children for lifelong emotional health and wellbeing (Bretherton, 1992). This article provides a basic understanding of the theory’s concepts, its origins, those who have contributed to it, how it was tested and important related literature. The article then examines two studies deepening attachment theory, and two current, real-world applications: parenting and marriage counselling. Finally, potential areas of future research are briefly explored. Attachment theory was developed between the nineteen forties and sixties by John Bowlby and Mary Ainsworth (Bretherton, 1992). Bowlby was a Cambridge graduate, and his career as a child psychiatrist is said to have been inspired by his early work in a school for maladjusted children (Bretherton, 1992). Mary Ainsworth graduated from the University of Toronto shortly before World War II and brought into attachment theory her interest in William Blatz’s security theory (Bretherton, 1992). In 1953, Bowlby’s research assistant James Robertson produced the moving film A Two-Year-Old Goes to Hospital (Robertson 1953), which greatly altered society’s expectation for the treatment of hospitalized children. Mary Main would later develop the Adult Attachment Interview, which applied attachment theory to adults, and will be explored later in this article (Main, George, Kaplan 1966). Attachment theory now encompasses a vast body of research, and many other notable psychologists and researchers have contributed to its growth (Bretherton, 1992). Drawing on concepts from ethology, cybernetics, information processing, developmental psychology, and psychoanalysis, attachment theory proposes that a caregiving relationship with an adult figure is vital to children’s healthy emotional development. It carries from security theory the idea that children must feel secure in their relationship (or attachment) with their parents to explore situations beyond their comfort zone (Blatz, 1966). Attachment theory links early maternal separation to personality struggles later in life and prioritizes secure attachment as the ‘jumping off point’ for further emotional growth (Bretherton, 1992). Bowlby was first inspired to investigate what would become attachment theory during his work at a school for maladjusted children. During this time, he became interested in the behavior of two children: one with no stable mother figure, who was distant and prone to theft, and the other, an endearing child who followed Bowlby around. It was the dynamics found in these two children that caused Bowlby to become interested in the effects of attachment on later personality development (Bretherton, 1992). In 1944, Bowlby administered a study of 88 patients at a child guidance clinic in London, in which he was able to link the patients’ symptoms to insecure attachment (Bowlby, 1944). Another pivotal study in attachment was Mary Ainsworth’s observation of infant-mother attachment in Uganda (Ainsworth, 1967). In the study, Ainsworth observed the interactions between Ugandan mothers and children, concluding that mothers who were ‘highly sensitive’ to the needs of their children provided more secure relationships with their children, and those infants cried less and explored their surroundings more (Ainsworth, 1967). Attachment theory was subsequently presented to the academic public by Bowlby in a series of three articles. The first of these papers, “The Nature of the Child’s Tie to His Mother” (Bowlby, 1958), opposed the popular psychoanalytic idea of attachment as secondary to need satisfaction. In the second article, “Separation Anxiety” (1959) Bowlby theorized that separation anxiety can arise during situations which evoke heightened attachment needs in an infant when no attachment figure is present to meet those needs. The final paper, “Grief and Mourning in Infancy and Early Childhood” (Bowlby, 1960), rejected the idea that infants and young children were not yet mature enough to truly mourn, and instead proposed that grief in both children and adults occurs when an attachment figure is consistently absent when the mourning individual experiences attachment needs. These three papers converged to create the first comprehensive resource for understanding attachment theory. A classic study grounded in attachment theory is Mary Ainsworth’s Strange Situation, a laboratory experiment involving fifty-six one-year-old infants, their mothers, and a stranger (Ainsworth, Bell 1970). The procedure began with mother and child in a play room with props for the infant to explore. Shortly after the mother and child are introduced to the environment, a stranger joins them. As the procedure continues, the mother and then the stranger leave the playroom. After a short time, the stranger and then the mother both return, and throughout this process, changes in the exploration level, along with any other notable behavior by the child, are observed through a one-way mirror. The demonstrated behaviors were coded by four classes of seven-point scales: Proximity- and Contact-Seeking Behaviors, Contact-Maintaining Behaviors, Contact- and Interaction-Resisting Behaviors, and Search Behavior (Ainsworth, Bell 1970). Attachment health was determined from the nature and extent of demonstrated behaviors in these categories. Upon reunion with the mother, the infants demonstrated diverse responses. Some infants appeared ambivalent; they wanted contact, however, they also appeared hostile towards the mother and kicked or swiped at her. Some infants seemed avoidant, indifferent to the mother’s return and did not initiate contact with her. Others initiated contact with the mother and seemed comforted by her return. Ainsworth related the reunion behavior of the infant to the health of their attachment to the mother: the infants who were ambivalent or avoidant were those who had a less positive relationship with the mother than those who were comforted by their mother’s return. The Strange Situation also found that the infants explored more when the mother was present without the stranger, and less when alone with the stranger, or completely alone (Bell, Ainsworth 1970). The results of this study demonstrated a relationship between infants’ security of attachment and their behavior in situations outside of their comfort zone. A second study which built on attachment theory was Mary Main’s development and application of the Adult Attachment Interview (Main, George, Kaplan 1966). This interview evaluates adults’ early parental attachment experiences, and the effects on their personality. The hour-long interview is transcribed word-for-word for later analysis. Its format allows space for the subject to give the researchers a comprehensive understanding of their attachment histories. The interview is described as ‘semi-clinical,’ and combines aspects of both the questionnaire format and the more informal clinical interview (Main, George, & Kaplan 1966). Differing from typical interview format, the Adult Attachment Interview compares content across all responses, and analyzes the speech intricacies of the subjects’ responses to conclude about their experience. Various criteria are systematically considered to reach conclusions about the subjects’ attachment history, and their general attitude towards attachment relationships. The study resulted in the classification of adults’ attitude towards their early attachment into five categories: secure-autonomous, dismissive, preoccupied-entangled, unresolved-disorganized, and cannot classify. The Secure-autonomous classification indicated that the subject valued attachment relationships and spoke openly about their experiences. Dismissive subjects demonstrated positive regard towards their parent figures which was incongruent with biographical evidence. Preoccupied-entangled subjects were unable to produce a cohesive idea of their attachment experiences. Unresolved-disorganized subjects showed apparent lapses in memory, or appeared to have not processed many attachment experiences, particularly traumatic experiences. The category cannot classify was reserved for subjects whose transcripts did not indicate any particular category, demonstrating a mixture of each. The development and findings of the Adult Attachment Interview contributed significantly to expansion on attachment theory by applying its concepts to adults, as previous research had largely been performed with children and animals. Attachment theory has been applied in the development of a parenting approach generally referred to as attachment parenting. Attachment parents respond to their child’s behavior in a way that is informed by the principles of attachment theory. They see much of problematic behavior as symptoms of unmet attachment needs. Attachment parenting focuses on first meeting the child’s need for attachment, and trusting that once attachment in secure, much problem behavior will go away on its own. Major contributors to this style of parenting are Dr. Gordon Neufeld (Neufeld, Maté, 2008) and husband-and-wife team, doctors Bill and Martha Sears (W. Sears, M. Sears, 2001). The Sears doctors developed Baby Bonding, which focuses on attachment parenting with infants aged zero to two years old. They recommend parenting strategies such as co-sleeping and baby wearing, which are both ways of promoting attachment by physical closeness to a caregiver. An important facet of the Sears’ philosophy involves how the parent reacts when the baby cries (W. Sears, M. Sears, 2001). Non-attachment style parents can often leave the infant to cry for extended periods of time, however, Baby-Bonding encourages parents to comfort their crying infants. This comes from the idea that a baby’s cry is its only way to communicate need, and therefore ignoring crying would be ignoring the baby’s needs, which would harm attachment. Gordon Neufeld extends these attachment principals into childhood and adolescence. He developed a six-stage model of attachment, which describes the child’s ever deepening levels of attachment, and their ways of holding on to attachment in increasingly secure and versatile ways. The six levels Neufeld identifies are being with, sameness, belonging and loyalty, significance, emotional intimacy, and psychological intimacy (Neufeld, Maté, 2008). Another context in which attachment theory is applied is marriage counselling. Clinical psychiatrist Sue Johnson developed an attachment-based marriage counselling approach, termed Emotionally Focused Therapy (EFT) (Johnson, Greenberg, 1988). EFT integrates attachment theory into couples’ therapy by building awareness of the attachment needs underlying many of the common struggles in marriage. Instead of reacting to surface issues, EFT helps couples take an insight-based approach to the attachment needs and wounds of both partners, and how each partner can understand and meet the other’s attachment needs (Johnson, Greenberg, 1988). I can apply attachment theory to my future professional life as a high school teacher. I have noticed throughout my education that I am able to learn most effectively when I have a positive relationship with my teacher: the more a teacher makes an effort to know me, and that I believe that my teacher likes me, the more I am motivated and inclined to do my best in my studies. I now understand this as being due to the attachment, or lack thereof, which develops between myself and my teacher. When I teach, I will incorporate concepts from attachment theory in the way I behave towards my students. I can strive to make learning a positive experience for students by building secure relationships with them, in which they feel heard, significant, and safe. I already apply these principles when I teach beginner horseback riding lessons: I aim to make my students feel welcome and accepted, while also keeping them safe and staying professional. While attachment theory is an area which has been studied extensively, there is still room for further research and application. There is a place for attachment theory in the classroom, and while attachment seems to be a ‘buzz word’ of the 21st century, very little has been done to educate teachers or school administrators on its benefits in their field. Schools are the intellectual birthplace of the next generation, therefore anything that may aid students’ learning success should be prioritized, and this includes attachment theory. Also, attachment theory could likely be applied to prison dynamics, both in cases where inmates are also parents, and with regards to the relationships between inmates and those responsible for them. Attachment theory revolutionized the way psychologists viewed relationships and behavior. It draws on concepts from ethology, cybernetics, information processing, developmental psychology, and psychoanalysis, and its main concept is that children must develop a secure relationship with the primary caregiver to be successful later in life. The theory could not have been developed without John Bowlby’s and Mary Ainsworth’s research. Today, it affects parenting techniques, and psychologists’ approaches to working with children and couples, along with many other areas. The application which I have found most relevant to myself is in the classroom. I hope to become a high school teacher, and I believe the concepts in attachment theory will be extremely helpful to me in this career. Blatz, W. E. (1966). Human security: Some reflections. Toronto, ON: University of Toronto Press. Bowlby, J. (1944). Forty-four juvenile thieves. International Journal of Psychoanalysis, 25, 19-21. Bowlby, J. (1960). Separation anxiety. The international journal of psycho-analysis, 41, 89. George, C., Kaplan, N., Main, M. (1996). Adult attachment interview. Unpublished manuscript, Department of Psychology, University of California, Berkeley (third edition). Greenberg, L. S., & Johnson, S. M. (1988). Emotionally focused therapy for couples. New York, NY: Guilford Press. Neufeld, G. & Mate, G (2004). Hold on to your kids: Why parents need to matter more than peers. Toronto, ON: Penguin Random House Canada. Robertson, J. (Producer) (Director). (1953). A two-year-old goes to hospital [Motion Picture]. United Kingdom: Tavistock Clinic. Sears, W., & Sears, M. (2001). The attachment parenting book: A common sense guide to understanding and nurturing your baby. Boston, MA: Little, Brown and Company. I am so impressed with Maren’s paper. She has a very insightful understanding of attachment theory and I like the way that she has related it to her goals of becoming and understanding and compassionate teacher herself and how she relates to her teachers presently. Well done! Thanks Susan! I think those comments/ applications relate so well to what we do as EFW professionals too! Such a good article. It really makes a lot of sense.